I can’t believe it’s Friday already! A week of vacation sure goes by faster than a week of work. Yeesh, that was fast! But it sounds like it was a good one. Time flies when you’re having fun. Enjoy the last few days. You know that saying “time flies…”? Well, IT’S TRUE! Enjoy your last few days. Yeah…vacation always flys by…and work–well, it’s work! Enjoy your weekend! But it’s more enjoyable when you take others along. Thanks for taking us with you on vacation, Carole. I had a grand time!! What a strikingly beautiful picture. It’s amazing how photography gives us the chance to look up close at what we might not take the time to see. It’s hard to believe tiny Baby Blues Eyes are this lovely. You’ve inspired me to learn to use my digital camera that’s been sitting in a box for a few months. I’ve been meaning to ask if all of the beautiful flowers in your photos are from your yard. They’re all so pretty! I hate that about vacation. Hey, where are the dyeing pictures??? Oh, I second that. No, wait. My last vacation involved heat, humidity, and two whining teenagers. Never mind. That is so true. At least you still have the weekend ahead of you. Definitely one of those NOT FAIR! Things in life. Love the picture. What kind of flower is that? I can’t believe it’s June already!! Missed you at Cummington. Thanks for taking the time to post your lovely flower photos. I have a black thumb 😉 so I have to live vicariously through other people’s gardens. Happy weekend! The photo of the Veronica is beautiful. That little ground hugging creeper is one of my favorite varieties. What a beautiful photo! I hope you got to at least dabble in all your favorite things over vacation. Have a restful weekend – work will still be there on Monday so don’t even think about it now! SIGH… I absolutely HATE that a vacation week is always shorter than work week! So pretty! Vacations do fly, don’t they? I can’t wait for ours. I cannot breathe…my breath was taken away by this picture! So true so you better enjoy your weekend! After a long week, your vacation pictures were a lovely welcome back to blogland! Gorgeous flowers! This book was stolen. It was recovered, and the thief was sentenced to two years hard labor. Vacation weeks go by so much faster than work weeks, don’t they? I hope you had an enjoyable one! It’s been a week already? Damn, time goes by too quickly. 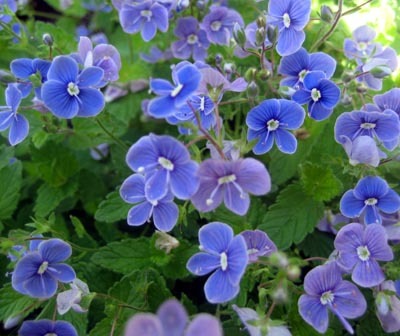 What beautiful blue flowers–thank you for sharing them with us! I want yarn in those beautiful colours!